Teeth Whitening Facts – DIY or Dentist? Images from the media of glamorous models and actors with sparkling white smiles have created a hunger in most of us for similarly beautiful teeth. 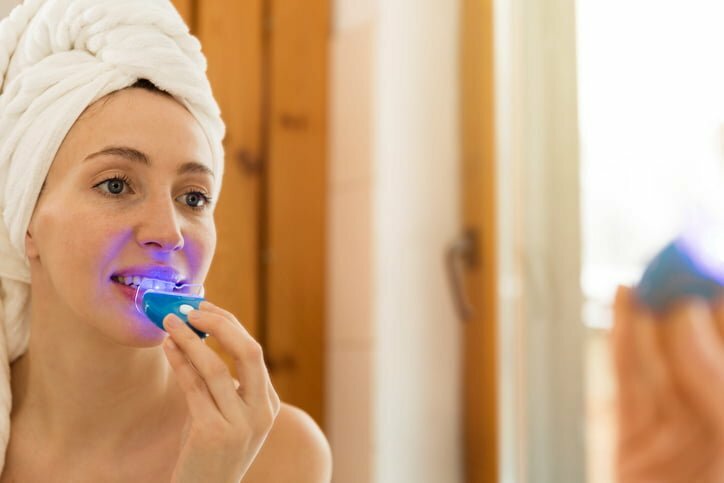 This has resulted in the development of ranges of ‘whitening’ toothpastes and home whitening kits, whitening treatments at hairdressers and beauty salons, and greater demand for professional whitening at dentists. So, what do you choose? Need you really visit the dentist, or can you do it yourself? Over the counter options range from whitening toothpastes that can be purchased from the supermarket, right through to do-it-yourself bleaching treatments. The toothpastes have dubious effects, according to the results of a 2005 Choice Magazine test. Similarly, home bleaching kits can produce mixed results, and also can irritate gums and other soft tissues due to ill fitting ‘one size fits all’ bleach trays that may allow the bleaching products to ooze over. The main issue with salon based bleaching treatments is that unlike a dentist, a beautician isn’t qualified to assess either your teeth, or the nature of the stains. Discolouration of teeth can be caused by a number of different factors – with the most likely culprits being tea, coffee, red wine and smoking. However, aging can also increase discolouration as the enamel thins, allowing the dentine layer to show through. Bleaching products can then further damage the enamel, making the problem worse. Your dentist will first assess your teeth for tooth and gum health, as well as ask you questions about lifestyle choices that may contribute to tooth discolouration. Your practitioner will then be able to choose the best treatment to deal with the discolouration you have – not all tooth discolouration responds to the same products. Dentists also have access to stronger bleaching products – which are no longer available over the counter, or to salon practitioners – which may help ensure that your treatment will be more successful. Long term, good management of your teeth, including effective teeth cleaning, is the best thing you can do to ensure they don’t get too stained in the first place. Again, this is something your dentist can help you with. They will also schedule regular deep cleans for you as part of ongoing dental maintenance, which also helps protect against decay. As is the case for many things pertaining to our health and welfare, the best thing you can do is seek the assistance of qualified personnel. In this particular instance, dentists have studied for many years in order to qualify, and are up-to-date with the latest products and techniques to keep your teeth healthy and to give you the appearance you want to have.